All prices include shipping and handling. Please place your order for either U.S. or International shipping based on your location. Please note that due to Gary's touring schedule, there may be a delay in shipping autographed CDs. Please be sure to let us know if you do not want your CD autographed. Note: We are currently touring on the Rockin' the Carribean Cruise through February 21. Any orders placed while we're away will be fulfilled after we return. INTERNATIONAL ORDERS: Please include your phone number during PayPal checkout. Failure to do so will delay shipment and delivery of your order. Buy your copy of CHRISTMAS IS ON! personally autographed by Gary U.S. Bonds! Makes no difference is you've been naughty or nice, 'cause it's a Gary U.S. Bonds Christmas! Either way, "Santa Gary" is coming down your chimney to start your party and he ain't leaving until he's had a cup of good cheer and a slow dance with your sister. 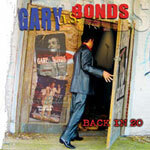 Buy your copy of BACK IN 20 personally autographed by Gary U.S. Bonds! Gary's first studio album in twenty years includes twelve tracks and features guest appearances by Bruce Springsteen, Southside Johnny, Dickey Betts and Phoebe Snow. 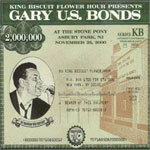 Buy your copy of "King Biscuit Flower Hour Presents Gary U.S. Bonds Live at The Stone Pony" personally autographed by Gary U.S. Bonds! This live CD recorded at the legendary Stone Pony in Asbury Park, New Jersey showcases Gary U.S. Bonds and his band at their rocking best! 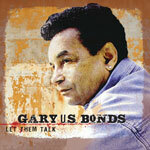 Buy your copy of LET THEM TALK personally autographed by Gary U.S. Bonds! LET THEM TALK features 12 new tracks that capture all of Bonds' boundless energy and emotion with storming arrangements, blistering vocals and deeply-felt ballads that move you to your core. It is the classic Gary U.S. Bonds experience and we are all invited to the party! Holy Shirt! Here's a brand new black t-shirt with Gary's silhouette in red, white and blue. Shirts are high-quality Gilden Heavy Weight Cotton and available in Medium, Large and Extra-Large. Holy Shirt! Get your brand new Gary U.S. Bonds t-shirt, printed in orange, yellow and white on black, with a cool logo on the front and the "Back In 20" album artwork on the back. Shirts are high-quality Fruit of the Loom, 100% cotton and available in Large and Extra-Large. High-quality gray baseball cap with Gary's red, white and blue logo embroidered on the front. One size fits all.